It was almost 4:00 pm this afternoon and I was sitting at my desk in the second bedroom writing an email to my sister who is now in Newman WA where she will be house sitting for a friend for about six weeks. 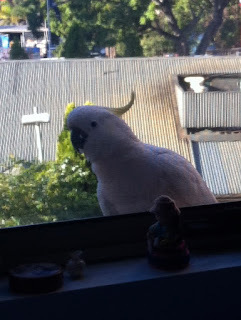 There was a bang at the window and I looked up to see this cockatoo sitting on my actual windowsill and staring at me. I 'm used to them on the balcony rail, out of sight to the left, but not on the sill. I grabbed the phone which was handy and took some pictures. The roof behind is glary and phone did not make allowances for that, but my camera was in a cupboard close to where the bird was. 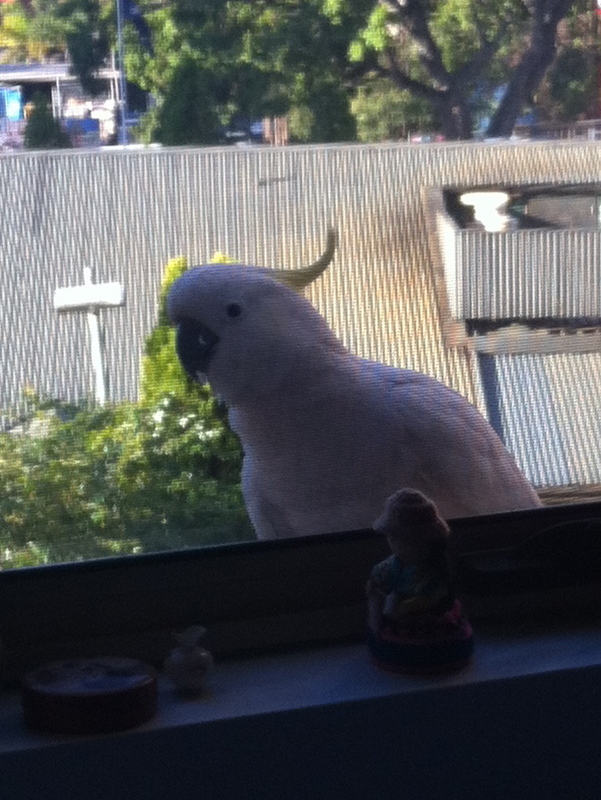 The noise I had heard was its beak hitting the glass of the window. It stared at me and showed no sign of moving. Every time it turned its head away, I took another step closer until I dared go no further. They had arrived early, I think food is getting scarcer and yesterday here was horrid, wet all day, very grey and quite chilly. It moved to the divider between the two windows and played peekaboo with me. Now you see me, now you don't sort of thing as it ducked behind the window frame. Eventually it decided it was getting nowhere with me and flew away. 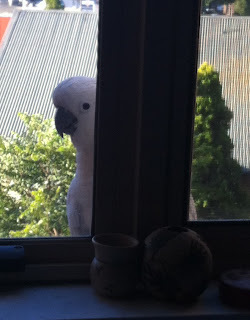 I had seen someone in another apartment offering a cockatoo food earlier in the afternoon. However, it didn't look like seeds or a seed cone and the bird was uninterested. I wouldn't feed them here. They are belligerent enough without being encouraged. I am finally catching up on my mystery shawl downloads. I like the concept but am unsure what the article will block out to. 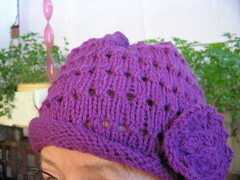 From the bump on the left up to the needles is thirty-two rows but there are no increases in the number of stitches in that section. I've double checked the pattern to make sure. I hope it will be OK when finally all stretched out. I was well behind with this and I think clue 7 is due tomorrow. I'm about 75% of the way through clue 5 and I have clue 6 on the iPad. I got behind when I realised DIL's birthday was last week, not this, and when I decided to do the Paton's balaclava for my son. That's still not finished. I must spend an hour or so on it and post it to him. I mentioned that he was sick and sounded terrible. He was finally able to see his regular doctor last Thursday and have some tests done. Results came back on Friday. Every one of them, parents and both children have whooping cough! They are all past the stage of being able to infect others but the cough is still there and may be there a long time yet. Especially for my son who was the last to get it. Childhood inoculations do not last for life as many of us think. Including me, until his elder brother had it about ten years ago at much the same age as this one is now. However, another granddaughter had it a couple of years ago just after her five year old booster shot, and the two with it now have had all shots at correct times. Her cough lasted three months and my son has been warned that he is looking at at least that same time frame. They are all on antibiotics just to make sure there is no actual infection left. Sutherland shire in the south has had an epidemic of whooping cough for several months now and it seems as if it's at that stage on the Central Coast. I was surprised when I opened my fruit and vege box on Tuesday. There was a large piece of daikon in it. Now I've tasted it, I knew what it was, but have never used it. It has a radish taste to it but to me it seems milder than many radishes. I've seen it used in salads but I knew it could be cooked. 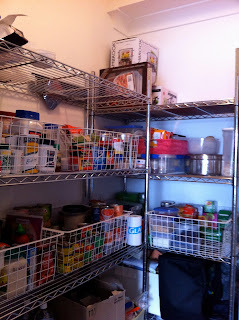 I decided to try it and searched for a few recipes, although I didn't find anything I wanted to try for just one person. I grated about 2/3 of what you can see here on the coarse grater. I put this into a colander and sprinkled it with salt. I left this draining for about an hour. While it was draining I broke an egg into another bowl, added a clove of garlic chopped, some red capsicum, half a large red onion and mixed all that together with a fork. Then I squeezed as much liquid as possible from the grated daikon which reduced in volume by a surprisingly large amount and mixed it into the egg mix. 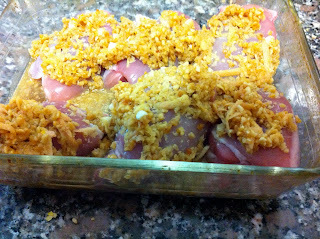 It was too runny to form patties so I added some breadcrumbs. My bread had a strong malt flavour so I used Panko crumbs from the pantry. Then I made balls and flattened and fried them. You can see the results in this other picture. I made three large patties and one smaller. With a squeeze of lemon juice they were quite nice and certainly different. They did not have a distinct radish flavour but I enjoyed them. I served then with lemon but aioli or sweet chilli jam or sauce would have been good too. They were a bit more fiddly to make than I usually do for just myself. I probably would not buy daikon just to make them. However, I was adventurous and did use the daikon. Well almost all of it and I think the rest will go. I hate waste but this could have easily sat in the vegetable bin in the fridge till I threw it out. Yesterday I went to my son's place up the coast to get my hair done. It was wet up there as it was most of the day in Sydney. However, there was a brief fine patch when I was about 30 minutes by train from the city. I looked out of the window at Normanhurst near the old brickworks and saw two tiny bunnies nibbling grass on the verge. I was past them before it dawned on me what I had really seen. There used to be a rabbit which would be out and about at about 5:30-6:00 am when I lived at Killara. Not in our place but on one of the side streets to the station. It was full grown, but these were small. I'm giving knitting a rest for a couple of days. I worked on son's balaclava most of Tuesday in an effort to have it ready to take it with me on Wednesday. I didn't get it done, but I did get very stiff shoulders and fingers. I'll probably pick it up again on Saturday but be more circumspect in how much I do. Shoulders are a lot looser today, they were very tight before. I hope your birthday is more cheerful than it would be were you down here. Wet, cold and very wet. It has rained non-stop for about 18 hours where I am, sometimes very heavily. Very dark, quite cold. I have in the first week of June had my gas heater on more than I did the entire winter last year. This was taken just before lunch, about 12:30. As you can see, it was quite dark. I've cropped the photo but what you see is what you get, otherwise. No retouching. I call this "raindrops keep falling on my head." and on the yard outside. The seagulls have been in their element and have been swimming in this puddle which was quite deep from the rain and much bigger than shown here this afternoon. Just the weather for soup. I had 200 gram of mushroom caps and some chicken stock I made yesterday from the bones of a small Macro brand organic chicken. I chopped the mushrooms, one clove of fairly potent garlic and a small onion. I removed the fat from the stock and cooked it all gently with some dried rosemary. 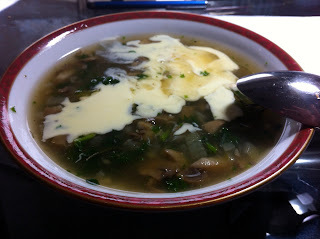 Just before serving I added fresh parsley and some lemon thyme and a small amount of cream. It was very runny so looks as if I used a lot. Just the meal for the weather. I could feel the warming effects of the soup for ages. not to mention its general yumminess. Here's the soup cooking. I have enough for another two lunches. The rain may go on Wednesday according to the forecasters, so extra soup is always a good thing. The chicken was quite small but adequate for just one person. It was just under a kilo. I roasted it and had some with vegetables the first night. The next day I took all the meat off and made the stock. The meat went into a white sauce with other goodies and a lot of leek and I made a chicken pot pie. Then tonight I had the last of the meat and sauce and other vegetables. Plus three lunches of soup. Not bad for $10. Macro brand food is now sold through Woolworths. They used to have a very large store in Hornsby on the floor above Woolworths. Lots of fresh organic meat and vegetables and a very large range of the usual beans. 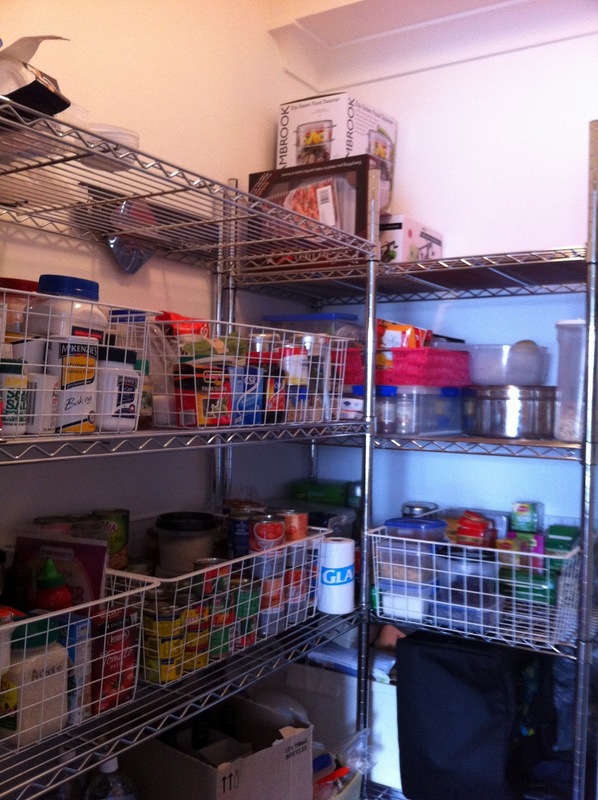 lentils, good shampoos etc. Then Woolworths took them over and announced proudly. "Now you can buy Macro goods here." So you could but about 5 % or less of what I could have bought before the takeover. I don't buy food specifically if it is organic but do often find that it tastes better than the usual range. Milk and eggs in particular. The wok burner to the left of the saucepans was mistreated before I bought here. The previous occupants ate loads of curry and other similar foods. Inside the burner is encrusted with baked on oils and spices and you can see the discolouration on the outside. We've even chipped at the encrusted burner with a screw driver. We've all had a turn and if one DIL in particular can't get something clean, then it's set there for life. 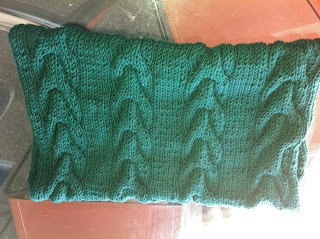 DIL loved the Pine tree Snood (or cowl) as I would call it. This picture should have been rotated, the cables are horizontal around the neck and it's quite deep so is very cosy. She and my son and my friend and I had dinner on her actual birthday at the local pizzeria. Well known, this place attracts customers from quite a long way away. It was only a minute's walk from my former home and my son was such a frequent customer that his design for pizza featured frequently on the blackboard menu. We had a lovely evening and all enjoyed ourselves. She was glad of the cowl. She's been in Darwin for a while visiting her brother and his wife and their one year old daughter. The climate back down here was much colder than there. Finally, more knitting. 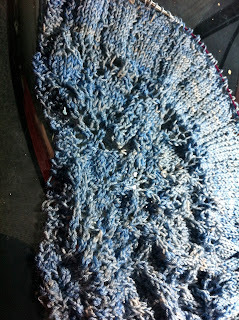 I'm plugging away on my Fellowship of the Ring Mystery Shawl KAL. I've been distracted by a mistake there. I ripped it all and then caught up. However, I concentrated on the cowl and I'm visiting youngest son on wednesday. He's been quite ill. We all thought it was possibly pneumonia and he sounded really rotten but seems to be on the mend now. I made him an alpaca scarf last year and he said he would love a balaclava. He had one as a child and enjoyed its cosiness. Where he catches the train in the morning is less than five metres from WoyWoy Bay and the chill off the water is bad in the morning. 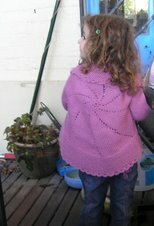 I finally found a very old pattern and have tweaked it a bit to modernise it. So that's been my main knitting for a couple of days now. I'm using what's left of the Serenade. I hope I have enough but if not, I'll do the stocking stitch at the top of the head in the black alpaca I have. It's June, so winter. I have friends in England where the season changes at the equinox but I hardly ever think of that here. Besides, although the days get longer after the equinox here, the temperatures get colder because of the slant of the earth away from the sun. I woke after a mild night to a very dark grey sky. While the night was mild, the temperature hasn't risen much so it's now cold. It's rained and looks generally miserable. The McDs outside has had electrical work done in the last couple of days. There seems to be something wrong with the wiring of the very large golden arches signs. Workmen spent some time on them a few weeks ago and the lights seem to regularly blow a fuse. The large sign to the right of this picture but off screen, had workmen at it all day yesterday. I looked out and there were two men in this crane this morning. The front of the sign was off and they appeared to be working on the woring. Just look how dark it is! This was mid-morning. There was misty fine rain and a few minutes after I took this, it poured. OH&S safety features seem ignored here. I'm glad they got down safely although some of the cover of the sign was not replaced in the rain. You can see the large yellow bit on the crane platform which did not get put back. Possibly the top of an arch. I still had lots of potatoes left over from the unused bag I bought for Mother's Day. I cooked some and quite a bit of a butternut pumpkin and made the best batch of pumpkin soup I can remember for a long time. So good, I had two serves for lunch. 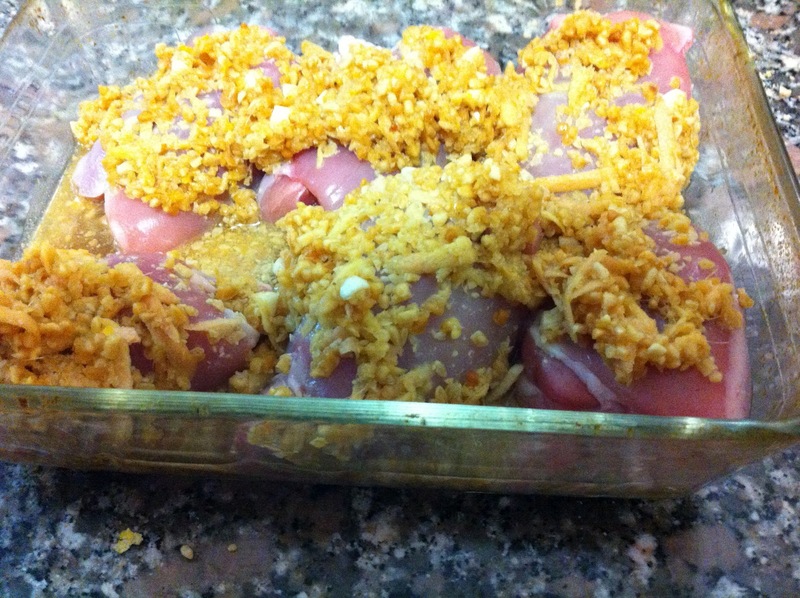 There's some in the fridge for lunch tomorrow and some in freezer for a week or so. I cooked a large piece of leek and some onion in frying pan and some of that was well browned and crunchy. Instead of blending that with the pumpkin and potato, I saved it and stirred it in with some parsley at the end. I used a heaped teaspoon of ground nutmeg, which I don't like, but which really enhances the pumpkin soup. Two bowlfuls went down well. Just right for the day. When I cooked the potatoes, I kept out a couple of pieces and I'm having fishcakes for diner. Another old fashioned meal, just right for the day. I bought two pieces of Tasmanian salmon yesterday and had one last night with other vegetables. One piece was cooked and leftover and is now mashed with the potato, some lemon, pepper and Dijon mustard just waiting for cooking. All I want now to suit the day is some T2 tea, possibly quince, and some gingernuts. Neither is in my pantry and the service station has a very poor range of biscuits, mostly chocolate which I don't buy. Knitting suits the weather too. 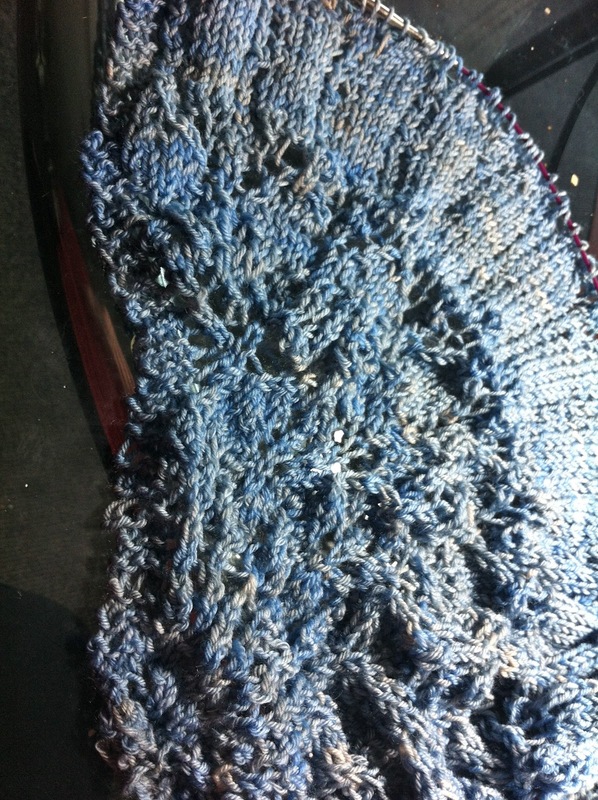 I've done the first two clues on the Lord of the Rings Fellowship shawl mystery clues. That's 34 rows. However my stitch count is out on the last row, so I'll have to have a good look at that. Possibly a missing YO. The next clue is due Monday. DIL's birthday is next Saturday so I'm making a cowl for her. The cable looks a bit wonky but that's the curve in the cord on circular needles. This cowl has the cables going horizontally around the cowl and the rather bright contrast is a provisional cast on to pull out when grafting ends together. This is true sit on the lounge and knit type TV knitting. Very regular in numbers and nine rows and then the cable row. It's 8 ply Bendigo Melody, merino, microfibre and cashmere. Good news on our security intercom. Notices now say next Wednesday is the day!! I think lack of information about it has been as annoying as the fact that we had to go downstairs to let people in.